New Knobroom version for LR4 is progressing steadily, and I’ve now reached the point that is sensible to create some UI elements as well. Except that Lightroom SDK is notoriously bad with growing UI elements. And if you’ve used the previous LR3 release, you might have noticed that creating lots of pulldown menus isn’t particularly fast either. The main problem is that once you have created a list of elements, there is no way to grow the list. And since the creation of elements is slow, you really can’t just create lots of hidden controls either. MIDI protocol is quite extensive, e.g. there are 128 id’s of each event, possibly on several channels. And since I’d like to support quite advanced configurations, I need something which I can grow dynamically. After few miserable attempts with pulldown menu spaghetti, I’ve come up with a list-based approach. Unfortunately, this simple_list component is only available on Lightroom 4. It is not dynamic either, but at least it is possible to unobtrusively fill it with blank rows. Basically, you can load a mapping preset (in JSON format) and edit it further by clicking the row in the large listbox. When you select the develop setting from the last pulldown menu, it is updated to the listbox. You can also insert new rows into the listbox by selecting a new event type (note, control change) and note/controller key id. Anyway, I’m working on a new release, and no, I don’t have a set date yet, but I’m hoping to release few first releases during August. Really looking forward to this! Thanks for all your work. This is excellent news! Here’s hoping you can quit your day-job. Very delighted to hear the news! I hope you can let us “play” with something soon! Awesome stuff, thanks for your great work 🙂 Can’t wait to pull out ye ol’ Korg again. Thank you for all your hard work on this project – anything we can do to improve productivity is invaluable. Is there a way to tweak Knobroom (or perhaps have another plugin) so we can use Hot-Keys or Shortcuts in conjunction with a gesture from a Magic Mouse or Apple Track Pad for some of the developing channels? For instance, if I wanted to slide my Exposure value a keystroke of Shift+E in addition to a one or two finger Up/Down swipe on the trackpad or mouse. Contrast, Highlights etc. would all work in similar fashion with their own designated keystroke plus gesture. I know there is a wide world of plugins and programs out there, and it seems like all get close to solving this, but I don’t see it out there. Your work and the Better Touch Tool are about as close as I have found. It just seems to me that this would be a great way to boost productivity using some of the hardware we already have in the keyboard and mouse. I would attempt to write my own plugin, but know nothing about that process. Again, sorry if this is out of bounds, but thought it might be worth asking. Thanks again for all the hard work and I look forward to the new plugin for LR4! Very excited! Can’t wait to have something to play with! Thanks for the update and I would suggest that $50 is not to much to ask for your program…. I personally would love it if JUST the basic panel was covered! Hi Jarno! It has been a while now… I guess we are all pretty excited here… How’s the work on Knobroom for LR4 going? Why not just open source this? I’d love to help with development, and it is obviously more than you have time or interest for. I’m sure others could contribute too. Jarno, then perhaps contact me directly. I’d be interested in helping then. I’m excited to hear about the continued development of Knobroom! unfortunately i was in flu this week, and there have been some set backs with the Lightroom UI stuff. So the UI draft is gone, its just not reliable to try to use Lightroom controls in dynamic manner. So the first version will have oldschool json based text interface. Any updates?! I am very excited to change my workflow! I’m waiting with bad breath, sorry baited breath…..
Sniikisti tehty;) I like. Kiitti tästä! Huomenna aika laaja keikka joten tämä tulee tarpeeseen ! I hear the leak reached my computer. Do you need anything thoroughly inspected in particular ? Thanks for the hard work, Jarno! This could seriously save me so much time! Looking forward to try this out! Sorry for all these newbie questions! Wow! This is very promising! Thank you for the quick reply and hand holding! Hope that this helps! This is all very cool! a) I’m researching which midi controller would fit best for me and Knobroom / LR 4… Trying to decide between the Behringer BCR2000 and the Icon iStage ( http://www.icondigitalusa.com/content/istage-velocity-sensitive-drum-pads ): I don’t like about the BCR is that it seems quite bulky and needs mains power… The iStage seems smaller and is bus powered… On the other hand the BCR is tested for this application and has been around for a bit… The iStage seems uncharted territory… Now to my question: The iStage allows for mapping two buttons to one CC#, one for increasing and one for decreasing values… Would that theoretically even work with Knobroom? b) I’d love to be able to select adjustment brush presets with a key command… Or with a button press… Is that possible in Knobroom? (I read on the Paddy discussion boards that the option exists in Paddy…) Or would a key macro program like Livid Instruments Selectrix ( http://blog.lividinstruments.com/forum/topic.php?id=3142 ) be needed (or even work aside Knobroom)? Thank you for your time, Jarno! I haven’t tried iStage, but generally I don’t like the rubbery feeling in buttons. In theory, using two buttons to increment/decrement values should work. I think Paddy uses purely event stuffing to do it’s work, I’m more interested in using the Lightroom’s API functions. Thus, you can’t really control the UI of Lightroom, because there is no official API for it. Using MIDI macro programs depends on the controller, you might need a virtual MIDI port to multiplex devices. Thank you for your pointers, Jarno! Appreciated! Hi Jarno. Looks promising indeed. It only looks at the moment though, for me. I registered knobroom even if it’s not working yet, as an encouragement: after the previous build problems, now I managed to create a list. Midi monitor receives data regularly on channel one, but in lightroom, with knobroom on, no changes happen… Any suggestion? Best regards and thanks for your work! Actually, there was a problem with Knobroom initialising, the sliders values were sent before the device was selected, which resulted in not getting proper output values. I fixed it today, so the build 678 should contain the fix (I haven’t tested the actual builds yet :). When you have selected mapping, started knobroom from plugin extras, Knobroom should send MIDI out messages to your device. These messages should display in MIDI Monitor (make sure to tick ‘Spy on output’ active). Well done Jarno, working really fine for me. For minor ideas/bug report/feature request do you have a dedicated mail or should we post it here ? Yep… Latest build works! 🙂 Thanks! Seems to be a bit slow-ish… Is that something you can address or it just depends on lightroom/my mac? “next pic” and “previous” are already available, you even have “go to first” and “go to last” ! There are not in the function list altough. But if you load the “BCF2000_simple” mapping, you’ll find them all the way down the map (CC 89 90 91 92). I’m planning to implement accessibility API, which should be a bit faster. If you try e.g. prev/next navigation, you can see that it is not communication to LR that is slow. Slowness comes from LR’s internal way of processing develop presets. Great Antoine! I was puzzled because I din’t see them in the list either. There is an empty row on the top of the list, or any of those dashed separator lines will serve as unassigned function. LR has no crop API, so it probably isn’t going to happen. Thank you for the progress versions, Jarno! – When importing the mapping Knobroom still needs to be restarted to make the mapping current. Great though that you are implementing new things! Love it! Please let me know about my other questions when you get those! I have just bought a Korg NanoKontrol2 and am looking to try it out with my LR4. I have followed the instructions in the readme file, however, when I go to Plug-in Extras and click on Start Knobroom, the TR4 application just closes down. I want to use the Ableton APC40 as midi controller for Lightroom via Knobroom. The problem is that all the control-data is sent on midi ch 0. Is it possible to change the midi ch? There is no option for that in the simple mapping UI, but if you edit the mapping json manually, it is keyed by MIDI event and a CC number (e.g. “0xb022” stands for Control Change on channel 0 number 22 (hex), 0xbf22 would be same CC on channel 15). Haven’t tested it, but it should work. Tnx for the fast reply. Basically it worked but with a delay (aprox. 1-2sec) when fader are touched. Is there a way to elliminate this delay? How do I implement midi notes in the programming? Jarno, thanks for the hard work to make our life easier! I’m heaving a hard time here trying to make it work! I’m using OSC Touch with OSCulator on Lightroom on my mac and it’s not working. I can see the faders moving on the quick look. So the app is working and the link is fine. And as OSCulator can’t set ch0, I have changed the .json file to use ch1. I’m trying to do it for two days now.. and I can’t find anything on the internet to help me. I haven’t tried OSculator, but is there a chance it is using channels 1-16 to represent actual channels 0-15? Now it’s working perfectly! Your plugin is awesome! Thanks for all the work that you put on it! =) Well done! I will try to do some post about my configuration. I am new to this program – running MacOSX. I bought a BCF2000 & loaded your json file. 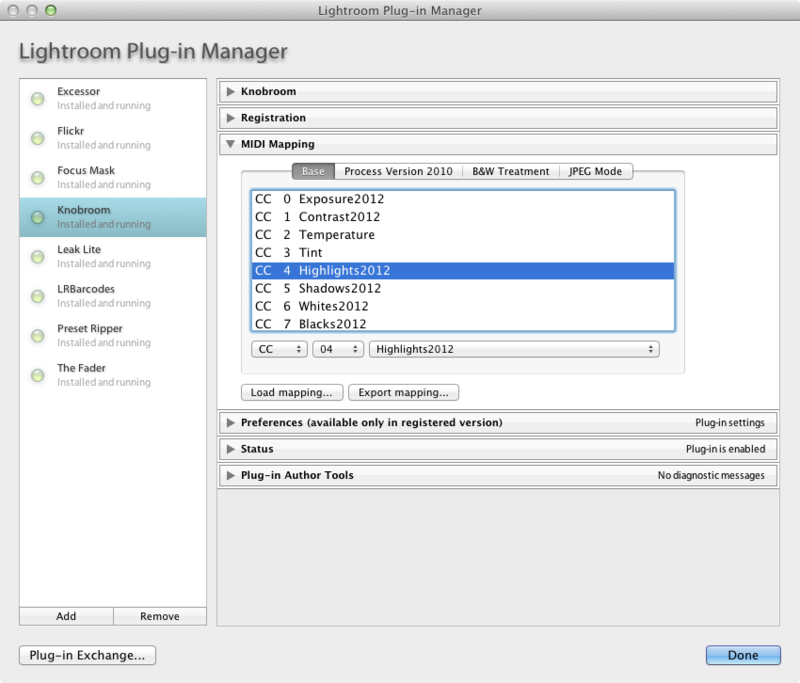 That file works & I understand how to reprogram the buttons in the Lightroom plug-in manager. However I am not sure which button is which, e.g., CC1 or CC2 etc. Some I can figure out but I can’t figure out what is controlling the Hue, Sat, Adjustments for each individual color nor the presets button. Do you have a key or map of the buttons on this device? Use MIDI monitor (http://www.snoize.com/MIDIMonitor) to see which CC number is each slider/knob. I can’t figure out how to map the buttons on the BCF2000 though. I’ve been trying to use an Ableton Push with Knobroom. I’ve been able to get it to work, however when I turn the knobs on the Push to increase a setting it’s backwards and decreases the value. In addition it’s changing the maximum amount possible rather than having increments. Is there a way to control the sensitivity and the direction? Hey there.. I can see the last update to this site is a couple of years ago. Is this program still being updated ? Well, there hasn’t been much updates lately, but on the other hand, there has been absolutely no API improvements from Adobe, and the current versions works. I’ve just made mapping for NI Z1 controller, kind of works. Big fun thou. Thank you for great development! All the best!